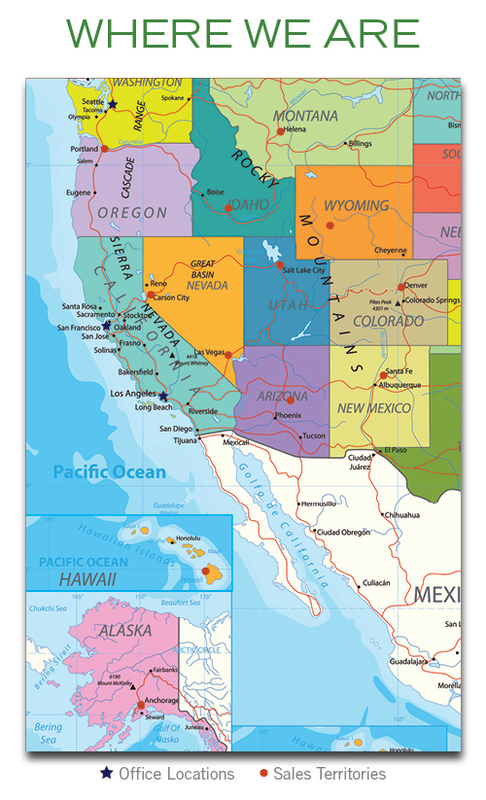 Nexus started out, in 1985, as a small family owned Manufacturer’s Representative Agency in Northern California and today we are proud to say that we have grown and expanded into 11 Western states. We specialize in promoting and marketing foodservice and janitorial disposables as well as chemicals and a variety of equipment into the distribution community. We have found that in order to be successful we have to be actively engaged with not only our partner distributors but with the largest key operators in all of our regions. This strategy has helped us find new sales growth year after year for our client manufacturers. Our valued operator and distributor customers are the key channels to entry into any given marketplace. 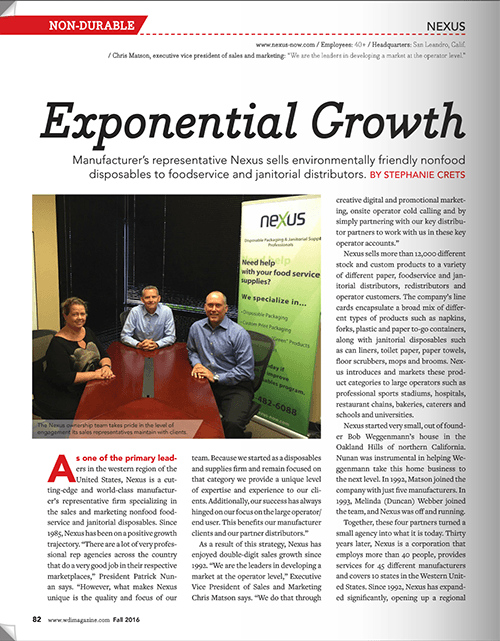 As a result Nexus provides our customers with a variety of sales tools and services that have proven over the past 30+ years to be critical in assisting both distributors and operators in properly choosing the right products for their needs. We are experts in technical product training, onsite product demonstrations, logistical order tracking, online digital marketing, cost control analysis, merchandising, menu innovation, product sourcing along with custom operational application consulting. We pride ourselves in responding quickly with answers and providing a high level of service to meet our customers’ needs. It’s a challenge every day to meet the growing demand within our industry but because of who we have become, how we have evolved and what we have learned we believe that we can be the link or the “nexus” to bridge the gap in any opportunity. EXPERIENCE – Over 250 years of combined industry experience and training among our employees in 11 states. SALES STRATEGIES – In all of our regions we spend 50% of our time with distributors and 50% with large key operators. ADMINISTRATIVE EFFICIENCIES – Our Inside Sales Support staff alleviates administrative workload that allows our Account Executives to dedicate more of their time to their customers in the marketplace. TECHNOLOGY – Our unique CRM and cloud-based enterprise technologies give us the capability to digitally promote new products to customers through email, online newsletters and social media campaigns. RELATIONSHIPS – Our sales executives maintain hundreds of customer relationships that give us quick entry into markets for our partner factories.